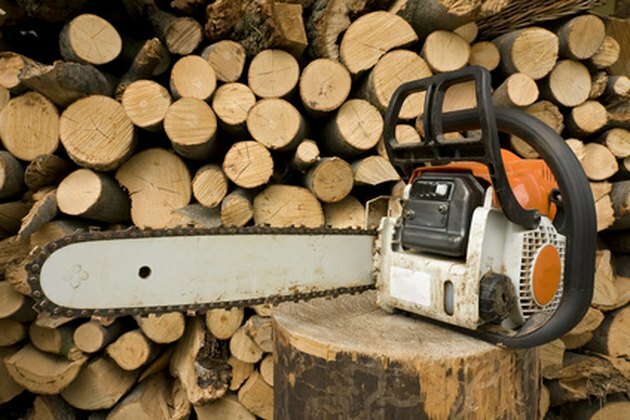 According to Stihl's engine service manuals, when the engine has no spark or a dramatic, sudden loss in power, the problem could lie in the ignition system. The ignition system ignites the fuel in the engine for proper combustion. When the spark isn't firing correctly, an influx of gas can bog the engine down or cause it to not start at all. Since you are dealing with potentially lethal high voltage, extreme caution is advised and safety gear should be worn at all times. Make sure your spark plug is properly gapped and free of deposits. Slide the rubber spark plug connector off of the spark plug. On most Stihl's this can be accessed from the top of the engine, underneath the chain brake handle. Unscrew the air filter cover and remove it, if you can't see it on top of the engine. Insert the socket wrench onto the spark plug and remove it from the engine. Discard the old spark plug and replace it with a new, identical spark plug, which will be recommended in your operator's manual. Make sure the spark plug is gapped according to your manual's specifications or else the engine won't start. Turn the ignition switch to the "On" position. Insert the spark plug into the rubber connector. Make sure the chain brake is disengaged by pulling back on the black chain brake handle, which runs atop the saw's engine. Hold the rubber plug and spark plug, with gloved hands, about 1 to 2 centimeters from a metal point on the engine block. Wipe any flammable gas or oil from the metal spot on the engine with the rag. Tug on the starter cord and look for a blue spark across the "hex" part of the spark plug, according to M & D Mower and Appliances' article, Engine Repair Help. Check to be sure the wires leading to the "On-Off" switch aren't tangled or touching a metal point on the engine if there is no spark, advises the Garden Grapevine website. Replace any wires if they are damaged or corroded.